UPDATE: Oklahoma Baptist Disaster Relief was informed that feeding units previously requested in Woodward are no longer needed. Related to Guthrie relief efforts, more than two dozen requests have been received for home site clean-up to date. GUTHRIE—Of the many who were affected by the Guthrie wildfires this week, Oklahoma Baptist Disaster Relief volunteers cleared multiple home sites of ash and debris on Wednesday. “Wherever we serve, we want to show God’s love for people in their hour of need,” added Porter. 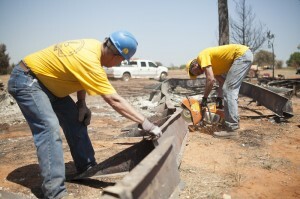 For more information about Baptist Disaster Relief, or to make a tax-deductible donation, visit www.okdisasterhelp.org.